Reflecting the more spcialised needs of experienced chefs and serious cooking enthusiasts, the gourmet set assembles five useful components the practiced cook expects, as well as two lids. Each piece possesses the rustic charm of cast iron handles as well as easy to care for brushed finishes, a feature exclusive to Falk Culinair. The innovative fusion of solid copper and hygienic stainless steel creates a product which has not only been patented by Falk, but also has become the industry standard. What this means to you is unequalled heat distribution and greater control over temperature, while the permanently bonded stainless lining ensures intense purity of flavour. Our savvy collection includes a mouth-watering multi-piece discount too! 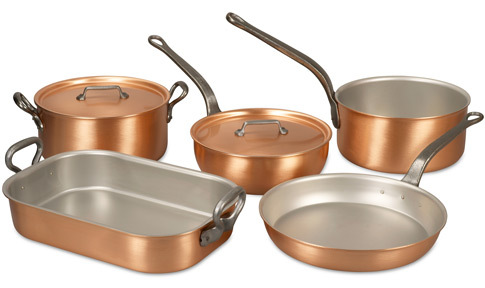 We know you'll love this	copper gourmet set	as much as we do. 1148 customers found this review helpful. Did you? Yes, I did!